p until about a year ago, I didn't even own jeans. Maybe one pair, and even they were khaki. Times change, people change...I've moved on. In my days at Conde Nast, I remember the fashion people wearing very high end designer jeans and I wondered what they were like. We're not talking Levis or Diesel, but rather a step above. So I read this and that and jumped in with both feet. It didn't take long to find out that the best place to go for kickass Japanese selvedge jeans in NYC is Blue In Green. 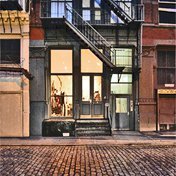 Located on Green Street near Canal, the place offers one of the biggest varieties of Japanese denim in New York. Don't be fooled by the size of the store; they have out only a few pairs of each with loads of stock in the back. Being one of those stores where you need to be buzzed in, I was expecting a less-than-helpful sales staff. I couldn't have been more wrong. These guys are knowledgeable and friendly and will patiently spend time with you. They'll pull everything off the shelves and let you try it on. They even have a book of photos that shows how various jeans they stock fade over time. Nearly all of the jeans they sell come un-hemmed. In the store they have a very special machine that hems denim. It's a free service for anything purchased in the store, and $30 if you bring in your own pair for hemming. 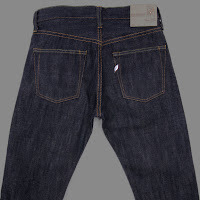 My first pair of jeans from them were made by Pure Blue Japan (lovingly referred to as PBJs by their loyal customers) and were the NC-005 Slim Straight jeans in blue. "NC" stands for "No Change". They're dyed with a special fade-resistant dye called "indanthrene" which allows them to be washed over and over again with little to no fading....perfect for "dress jeans" that you want to look new. "Slim straight" means a tighter fit in the thigh with no taper toward the ankle. The embroidered leaf in back is the PBJ trademark. A particular quality of PBJs is a "slubby" texture to the denim. It's rough to the touch and a little "hairy" for the lack of a better word. It fits like a dream and feels great. Later on, I upped the stakes and got the AI-002 Natural Indigo jeans. The warp threads are repeatedly hand dyed in natural indigo, making the thread absorb more dye than in machine processes. At 18.5 ounces, it's a heavy denim that's perfect for winter. 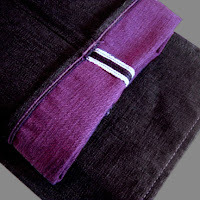 Two color seam stitching adds to the charm. Why Japanese? At the end of WWII, the Japanese grew to love blue jeans, and began making their own. Perhaps it was due to all the US servicemen present. So they took what we knew about weaving denim and expanded upon it greatly. They experimented with weaving, dyes, and cut. 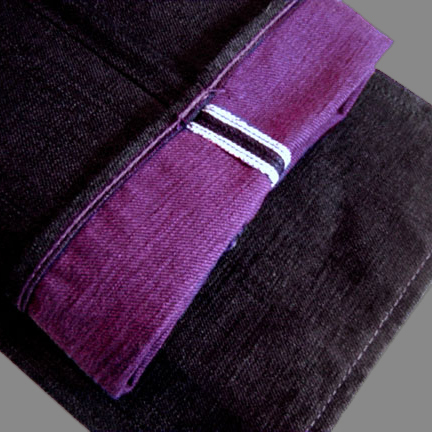 One pair of PBJs has an indigo warp and a purple weft. The weft is typically white, which is why jeans get lighter as they fade. These get purple as they fade, which is really quite awesome. While we here in the states got used to our brands of jeans, the Japanese innovated. Today, there are quite some number of boutique jeans companies in Japan, and there's something for everyone. And if you give it a try, my guess is you'll never go back. And once you wear them for a while, you'll begin to notice the jeans other people are wearing and how they stack up. Or don't.